Elite Premium Class A RV Cover fits RVs 40' to 42' Extra Tall Up to 140"
Our Elite Premium RV Covers are made of a UV treated, 4-layer non-woven fabric. The top is waterproof and will keep out rain and snow while a special venting system inside helps water vapor and condensation evaporate. 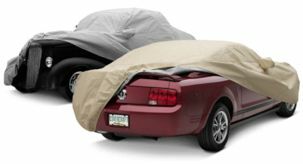 It will protect an RV against rain, snow, UV rays, dirt, nicks and scratches. The integrated air vent system, combined with the 4-layer top and strong single layer sides will reduce wind stress and vent inside moisture. Another great feature is the zippered side panels that will allow access to the RV doors and engine areas. Adjustable front and rear tension panels combined with elasticized corner hems will help provide a great custom fit. There is a FREE storage bag included and an Incredible 3 Year Warranty. Maximum height is 122" measured from the ground to the roof, excluding AC units. The overall length includes the bumpers and ladder but not the hitch.